I have been able to get both my girls to part with their binkies just after they turned one. There are a few things I did that helped make the transition easy. I thought about sharing this awhile back but I didn’t know if it would work on Heather. Now that I got Heather to ditch the binky too I think this is a method that will work on more than just my children. 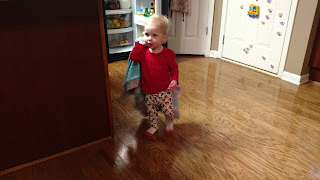 Heather dragging her blanket around the house today. I need to put a big disclaimer here... Neither of my girls ever took a bottle. They were pretty much only breastfeed from the breast. If I did need to leave one of them at home they drank breast milk straight out of a cup, from a straw, or a sippy cup with a hard top. We tried pretty hard to get Heather to take a bottle and she refused. Just keep in mind, if you bottle fed your little one this method may or may not work for you, I have no idea. Also, both my girls were completely transitioned to whole milk when we got rid of binkies. They were being sent to bed with a sippy cup of milk, I think they were falling asleep drinking milk and not looking for binkies after they had finished their milk. I do not know how this would work if you are still breastfeeding. The biggest thing going for this method, is that most one year olds most do not have a word for binky yet. They cannot/do not know how to ask for it. If we would have waited till later than 12 months with Heather I think speech would have been a problem. Heather has a lot of words now that she is 14 going on 15 months old. I am glad we got her off the binky when we did. Here are the steps I have used to ditch the binky. Attach your child to something other than a binky. 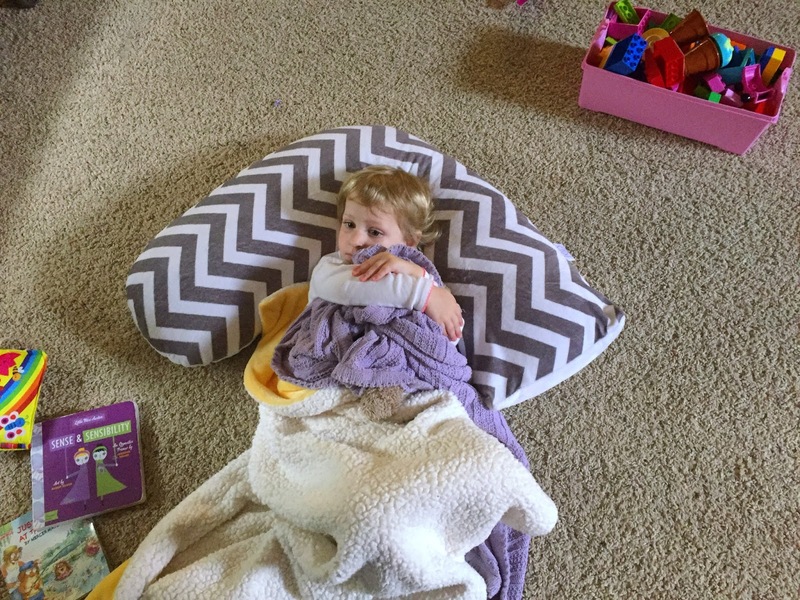 A blanket, a lovey, a stuffed animal, whatever your child gravitates to most. Preparing to get rid of the binky starts day one. Day one as in the day your baby is born. Your child needs something other than a pacifier to soothe him/her. Rose has a knit blanket that she takes everywhere with her. Heather has a minky blanket with silky borders that I made. My daughters are usually attached to a stuffed animal of some sort as well, but those rotate. Their blankets are always with them. The step is critical. It’s important that your child has something other than a binky that makes them feel secure. You do not want to take away their only security item. It will not go well if they only thing they depend on to soothe them is the thing you take away. Attempt to soothe your child with with their alternative object before giving them a binky. 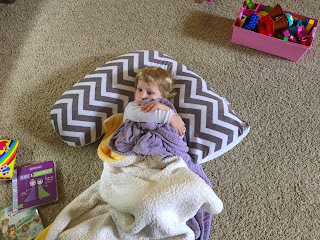 A snuggle with a blanket or stuffed animal might be just what they need. If they are soothed with their blanket more they will naturally prefer it over the binky. 2. Approaching your child’s first birthday try to cut down on binky time, save it for naps, bedtime, car rides. Then limit to naps and bedtime. When/if your child begins to lose interest in their binky make sure to act quickly. You never know how long the window will last. Rose was around 15 months when we took her binky away. I actually forgot to put her to bed with a binky one night. She slept the entire night so we gathered up all the binkies and went cold turkey. Rose did just fine without a binky from then on. 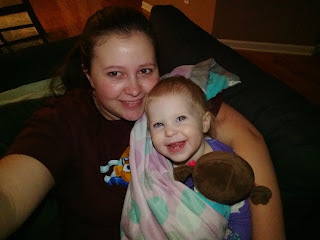 I believe she got sick the next week so I am unsure if the fussing was because the binky was gone or if she battling the cold. With Heather we purposely put her to bed without a binky one night, we gathered all her binkies and put them away. She slept that whole night. The next night she woke up around 5 and was a little off. I am unsure if that was because we got rid of the binkies or if it was because she was seriously teething. It’s been over a month now and she has really really bonded to her blanket. Rose still need snuggles with her blanket all the time. The night you decide to ditch the binky clear your child’s crib and bedroom of all binkies. After putting your little one to bed scavenge the house, car, stroller for any spare binkies and hide them up high in a cabinet. If your little one is really fussy try not to give up. Try a new blanket or maybe an extra stuffed animal. The goal is to switch the binky with something else. You want your little one to feel secure and comforted. We try not to backtrack at all costs no matter what we are doing in the Ayres house. So far it has worked well (except for potty training, but that’s a whole other post). Both Heather and Rose love their blankets. Heather has been dragging hers around with her every where the past few weeks and it’s adorable. I hope this method works for other people out there. It has worked amazingly for us. RJ’s previous daughter had a binky much much too old. He was ecstatic when we accidently got Rose to ditch hers early. I am very glad this method worked for Heather too. Hopefully we will never have two children with binkies at once. Thanks for reading. Keep an eye out for my next blog post It will be a good one!